A kid’s world is replete with the need to know and explore new things. What better way to nurture their curiosity than by introducing them to a set of drums. You will soon realize that they are natural percussionists as they seek to use their hands to rub, strike, and even scrape at stuff. 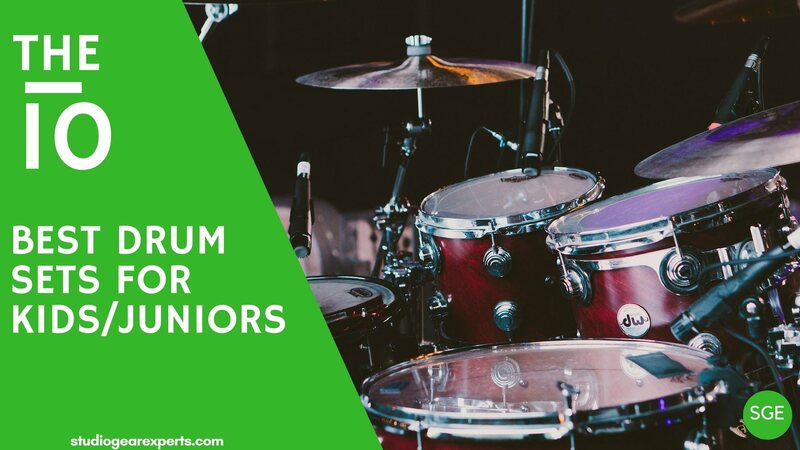 With a drum set, they will have a new hobby and a real chance of mastering a skill that only years of drumming can provide. For kids under the age of 10, full-sized kits are too large. That’s why you will need to look at junior sets. They are much cheaper so you won’t have to spend a fortune on their first musical instrument. These drum sets come with the needed hardware including hi-hats so that they can learn to play correctly. A proper junior set should have at least five pieces, but smaller kids can make do with only three pieces. The 5-piece should include the snare drum, bass drum, three toms, hi-hats, and a crash/ride cymbal. It will set them on a path of fun, control, and patience that only a drum set can afford. Here are 10 of the Best Drum Sets for Kids. They come recommended by teachers and parents. They are affordable; with all the right pieces. We hope your child will have lots of fun as they kickstart their drumming career. Does your child have a passion for drumming? Well, if they can’t stop making music from kitchen utensils, then it’s time you engage them with the Sound Percussion Lil Kicker Junior Drumset. It has all the perks of a full-size set, but you won’t be dealing with the noise associated with standard drums. This kit has three pieces including a bass drum, snare drum, a tom, plus the cymbals and the associating accessories. The top boasts a construction from multi-ply wood shells to give a warm pitch and tone. Every beginner desires to identify rhythm that’s why with the tom your child can learn how to color their music. You’ll love that it has fully tunable and replaceable top and bottom heads. This makes it quite durable as you can depend on them for many years until your kid grows out the size of these drums. It also has all the stands for the two cymbals and a well-padded throne. And you won’t go searching for the tuning key or drumsticks as it is complete with all the accessories. The single braced hardware is sturdy to support a modern tone fit for many styles. It is the ideal pick for toddlers and kids starting their development classes. Although the cymbals might sound weak, this is a plus as they are not very loud. Honestly, you won’t like the first few days with this drum set, but you can be sure it won’t be waking up your neighbors. Ddrum has managed to produce some of the most sought musical instruments on the market today. If you want a drum set for your kid aged from 5-8 years, the ddrum D1 PB D1 might be just what you want. It is complete with the hardware, cymbals, and throne for your child to start their drumming lessons right away. While most kids’ drum sets come with only one tom, this model has three toms plus the 16-inch bass drum, and a 12-inch snare drum. With the hi-hats and crash cymbals, this set is created to suit kids who have an edge in their music style. It has the versatility to create different sounds so they can learn control and be ready to take on a full-size drum set. Not to mention, it has the shells cut out to 45-degrees bearing edges to express countless styles. You’ll be happy with the high-quality designing owing to the durable PVC wrap shells. It is engineered for hard strikes and heavy stomping for years on end. If you have a strong kid that loves banging, they will be able to use this set without it falling apart. Apart from the drums and cymbals, you will be able to complete this set with the stands, throne, and sticks. The drum stool is also adjustable, and it is well-cushioned to protect your kid’s bottom. Most parents love the tone and the fact that the crash cymbal does not make lots of noise. For a beginner’s drum set, it values quality but remains affordable. The Children’s Junior Sparkle brand is slowly gaining popularity for their genuinely affordable products. This model features three real drums recommended for children between the ages of 3-5 years old. These are three real drums to give kids a real chance in learning drums at a young age. This will captivate their minds and even help master their skills. With the Junior Sparkle, you have a 12-inch bass drum, 8-inch snare, and an 8-inch tom. These are actual drums so be ready for a hard beating and noise at least until kids learn their first proper rhythm. It includes the bass drum kick pedal, an adjustable drum stool, drumsticks, and a tuning key. This set brings out the passion of your kid as the drums achieve great sound. It’s only that it has been scaled down to a size that is comfortable for small kids. Seeing that the specifications are those of real drums, you can be sure that any sound created can be taken on a standard drum set. Better still, it is totally tunable on both top and bottom drum heads. It has a large bass drum that serves as the foundation of rhythm in any piece of music the child creates. We can say that one tom is more than enough for a budding percussionist. This set only has one, and your kid will never lack the skill to transition from one song to the next. You’ll even like that it has moderated on the drum head materials. As you know, little means a lot can be achieved on any drum head that is not over-emphasized. Only that the Sparkle junior is reinforced so that it can last in good condition. You’ll get it in many colors. Whichever preference for your kid, they can have this purple one or choose from black, blue, green, red, silver, wine-red, sparkle green, sparkle purple, and sparkle turquoise-all the colors to entertain a young mind. When you realize your kid can keep their rhythm especially when singing, clapping, or tapping their feet, the next thing would be to bring them a gift to practice their talent. There’s no need of buying overpriced toy drums when you can have the RockJam at a very reasonable price. This kit is not only high-quality, but the sound is excellent too. It has three drums scaled down to a size that fits kids from three years. The bass drum uses a chain driven foot pedal. It gives kids a smooth footing so they can be in rhythm at all times. With this set, the snare drum stands alone while the cymbal and tom hang using stable holders. Since the snare drum is not connected to the other pieces, it can be moved to a different location when kids just want to have separate drumming fun. But children can always make a complete tune together with the versatile tom-tom and the low-tone bass drum. The crash cymbal is another integral piece that helps to complete rhythm. Usually the first piece to draw attention to any new percussionist, be sure to start shouting over the loud crashing sound produced by this cymbal. You get a sturdy model that comes with robust stands plus easy instructions to follow during assembly. Talking of durability, this kit comes with lightweight drumsticks. Not to say they’ll be breaking on their first strike but they are built to resist breakage. It also has a height-adjustable, cushioned stool. It provides that extra comfort so that your kid can drum for hours on end without fatigue. If your kid does not have a drum infatuation that will go after a while, then get them the GP Percussion 5-Piece Drum Set. It has all the things that complete a basic drum set without any extras that may add to the confusion. With these drums, you can be sure they are laying the foundation for big stages and the entertainment scene at a young age. The GP Percussion brand is well-recognized by lovers of acoustic drums. It sets the stage where everyone can find their particular piece to grow their talent at whichever level of learning. The GP55WR has a 4-lug, 16-inch bass drum. It is built for the stronger kids who have their eyes on hard rock. We expect that no amount of banging can displace this drum from its stand. The snare drum is 10 inches wide with four lugs. It has its stand, but the ride toms use a stable hanger to keep them from falling over. The floor tom is 12-inches wide with four lugs. Everything about the GP Percussion suggests reliability in that it won’t come apart in the middle of play. You will also like the hi-hat cymbals and the crash cymbal that make it come together cleanly as a complete set. Looking at the materials that make it, you will notice that the drum heads all use a thin multi-ply wood with reinforced center edges. It utilizes medium-weight heads that can withstand the pressure from the heaviest hard hitters. This is especially important when you want it to retain the tune you select when you assemble it. The edges also help in sound control, so your kid is up to making some beautiful music. The drum shells also exhibit quality alongside the brass cymbals. It is one of those sets that can be passed on to younger kids after they outgrow this make and move on to more sophisticated designs. Lastly, the overall dimensions of the 5-piece set are ideal for small spaces. hen you’ll want to consider the GP Percussion 3-Piece GP50BL. It suits youngsters the age of 3-5 yrs owing to the small size. It is great with sound since it is not loud and noisy. It is precisely what you’ll want to hear since you’ll be hearing it first hand from a kid who is excited about their newest real toy. The set includes a 6-lug, 16-inch bass drum, 5-lug, 10-inch snare, and a 5-lug, 10-inch tom-tom. As you can tell from the many lugs, it can handle hard hits. This set is built to serve for a decent period. As such it uses highly durable and reliable materials. The black, ported drumhead does not show any signs of being a beginner’s piece. It showcases a sturdy ply coat to handle lots of banging. We especially like the quality of cymbals. Many junior sets do not pay attention to the cymbals with the idea that kids can’t strike it hard enough to bend it. But the GP50BL uses sturdy cymbals with a small diameter to produce an explosive sound. Even with the loud crash sound, it is intended to die right away, and this model does not suffer from all-around attack sounds. The junior throne on the GP Percussion is soft and well-cushioned. You can adjust the height to accommodate different kids. Not to mention, you do not need extra tools to assemble the set. The instructions seem a bit vague, but it is straightforward all the way. Many people assemble it for only 30 minutes. Plus it is quite easy to move around with the whole kit weighing only 34 pounds. Ludwig makes top of the line drum sets. Their junior 5-piece set is particularly famous for having the necessities to support and grow young drumming talent. It is equipped with the necessary drums as well as being in a size that is comfortable for children. It comes with completely tunable drumheads so your kid can play continuously without fine-tuning the drums every few minutes. It also has hi-hat cymbals and a ride/crash cymbal. They do not sound crappy at all, and they are built not to crack when struck by the strongest kids. These cymbals will improve the range of the tones with the help of the rich sound created by the high-quality drums. Besides, it has 6-ply poplar shells that make it pro-quality in terms of sound and durability. It has great sonic potential especially if you tune them correctly. You will enjoy the different rhythms and styles created by your kid on this set. When it comes to longevity, we love that Ludwig uses aluminum alloy on all the rods and screws. They can withstand the extremities so they won’t get corroded if your child leaves them exposed to the elements. Plus the drum hardware is of steel, so they are virtually indestructible. The snare stand is a unique entity as it is made to offer support to the freestanding snare drum. The throne is not only comfortable, but it can also be modified to accommodate kids with various heights. Ludwig is a legendary brand that oozes authenticity every way you look at it. Mendini drum sets are some of the most simplistic models that offer your kid a real shot at drumming. The 3-piece model is an excellent choice for kids under the age of five. It has the basic hardware that counts when your rookie rock star is just starting out their drumming skills. It is a small size, but it gets the sound quality almost equivalent to that of full-sized drum sets. This set comes with a 13-inch bass drum, 8-inch mounted tom-tom and a 10-inch snare drum. The three drums are all your kid will ever ask for. You will be able to install these drums on their respective stands with the tom using a sturdy holder. It also comes with an 8-inch cymbal arm to hold the crash cymbal. The Mendini is also equipped with a height-adjustable throne, a tuning key, a bass drum pedal, and a pair of lightweight, wooden drumsticks. The drum set uses four lugs for stability more so for the drum bass. It is intended to withstand hard thumping and still stay put. It is an extremely easy to learn drum set, and you won’t feel like it is an extravagant piece for your kid to own at such a young age. The quality of this drum set speaks a lot about the brand you will be buying. It is available in a multi-ply drum head. The sides are reinforced, but it’s not overdone so that your child can find their tone and stick to it. When you tune it in, only fatigue will get your child off the throne. If your kid is showing a little more interest in drums, they can go all in and start performing with a 5-piece drum set. The Mendini by Cecilio model grabs one attention not because of the flashy color but because of the sound it produces. It is built with well-chosen materials to ensure that after you tune it, there’s no going back for your child. They are set to learn and even enjoy their time with this kit. You get a 16-inch bass drum, 10-inch and 8-inch tom-toms, a 12-inch floor tom, and a matching 10-inch snare drum. It is a perfect fit for kids taller than 2.5ft with everything set to the right standard. This means your kid will never have to relearn any motions after they start on this model. The drumhead quality is also incredible to support the most remarkable grooves. One recurring complaint is about the crash cymbal, but parents appreciate that the sound does not affect how the drums sound. The drum shells have a balance of softness that can go from a medium to a hard tone. Many people consider them warm most probably because they are intended for beginners. The Gammon Percussion 5-Piece Junior Drum Set packs the most pro features for a beginner’s kit. It arguably delivers the most reliable features with most parents and teachers recommending its sound and quality. Your child needn’t be overwhelmed with many pieces when they can start their perfection on a kit that sounds like that of a rock star. With the Gammon Percussion, it gives you a 16-inch bass drum, together with two drums, a floor tom, and a snare drum. These drums use real wood shells. It can give a fundamental soft tone, as well as a warm tone to kick start a young drumming career. Fortunately, the cymbals are also high-quality. They resist cracking or bending even with constant strikes by active kids. The crash cymbals can give the desired crash sound, and the hi-hats can give that nice click sound. It represents a set that is not fragile so it will be of service for the longest time. It’s probably the most memorable gift you’ll ever give a kid who can’t stop making music from their toys. For kids who are keen on detail, they will be able to choose from different colors. This is more so for children who are motivated by the beauty of their toys. This kit comes with a glossy finish adding the appeal of a real drum set. When picking a drum set for your kid, it’s important to complement it with their ability. You want it to be simple to learn, but also captivate their interest so that they can master the new skill. Here are the essential things to consider. Which is the age-appropriate drum set? Junior drum sets are either 3-piece or 5-piece models. 3-piece models are mostly recommended for kids under the age of five because there’s not much to learn except for the snare drum, bass drum, and tom-tom. For kids who are above five yrs, they can add more abilities by using up to 5-piece sets. They have two additional toms which mean they can add variety to their music. Apart from adding tom drums, you also need to consider the additional stuff like cymbals and lugs. Kids will basically need a crash cymbal, but if they are great at keeping rhythm, you can include hi-hat cymbals. For the lugs, you’ll want to consider the force your kid will apply. You don’t want a drum set that comes apart with the first bang. Look for more lugs that can keep a kit stable at all times. If you really want your child to master the ropes at a young age, giving them toys means they’ll have to re-learn drumming. A real shot only comes with real drums. It’s no question that a drum kit will impact your child’s ability in learning. You want them to enjoy their new gift and not be overwhelmed by having to learn too much. We recommend the above brands as they meet the specifications for what kids need at a young age. It’s always important to stick to a 5-piece set- at least until they are ready to take on more drums at a more advanced level.